This Charlottesville horse farm is waiting for you. Tucked in a private setting in the rolling hills of Charlottesville is this small horse farm in Emerald Forest. Standing on a 5 acre lot, this property is well-planned and has everything that a horse farm could need. If you have been longing for a country escape and would like to raise horses, this Charlottesville horse farm for sale is what you have been looking for. The property comes with a 4 stall center aisle barn, a tack room, a large hay and equipment barn, a lighted ring, two pastures and paddocks. It also offers a beautiful one-level home featuring 3 bedrooms, 3.5 bathrooms walk-out terrace level, an oversized garage and an open plan layout. 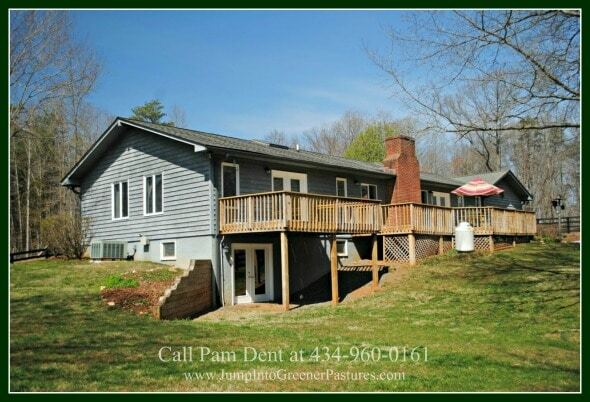 Comfortable living and privacy are yours in this Charlottesville country home, priced at ONLY $599,000. Albemarle – a family-friendly community with great views. Albemarle is located in Central Virginia. Its county seat is Charlottesville. A historic community, Albemarle is filled with scenic views of gently rolling pastures against mountains, as well as wooded views. This home lies in the west side of Albemarle, close to Crozet. From this home, all local schools in the popular Western Albemarle school district are within a 1.5 mile radius. There are also many shopping and dining options on Route 250, just a few minutes away from this home. And you are also minutes from I-64 for commuting. A horse farm that has everything you need. This turnkey Central Virginia horse farm for sale comes equipped with a 4-stall center aisle barn. The center aisle barn with two overhangs is designed for ease of operation. It allows for convenient storage and as well as providing four 12’x12’ fully matted stalls with drains for your horses. It also has a spacious tack room to store your saddles and bridles as well as a separate feed room. A large hay/equipment barn is located close to the stable. Be welcomed by this home’s well-maintained, landscaped front yard as you walk to its front door. Fall in love with the warm and inviting living room. Step into a spacious and combined living room and formal dining room. Vaulted ceilings, large windows and hardwood floors welcome you in this inviting space. The gleaming hardwood floor extends throughout the main living area of the house, giving warmth and a touch of sophistication. Vaulted ceilings and light painted walls enhance the open space while the big windows let in plenty of natural light. This room is the perfect setting for entertaining friends or hosting parties. Next to the great room is the combined family room and kitchen. This open kitchen/family room layout has a cozy appeal. The family room is distinct for its beautiful fireplace. Placing a carpet on the sitting area floor will further enhance this room’s welcoming appeal. On the other side of the room is the beautiful and spacious kitchen. Equipped with lots of counter space, updated appliances, and plenty of cabinets, your inner chef is sure to be thrilled. This eat-in kitchen also has a space for a breakfast nook and a breakfast bar. Just off the family room is a large deck. It is a perfect place to unwind during summer evenings or to entertain friends and visitors. Privacy and retreat are yours in this home’s master bedroom. Make this home’s master suite your private haven. Light flows freely through the large windows, making this room bright and airy. The carpeted floor gives this bedroom a cozy and intimate feel. This big room can fit your king size bed with additional furniture, and still have space for you to move around comfortably. Get the best sleep and rest on your warm and comfortable bed, in this peaceful country setting. This master bedroom has large French doors which open to its own deck. The two other bedrooms of this home are equally bright and spacious, providing the best rest and relaxation. A terrace level room that provides more living space. This home also offers a huge terrace level recreation room that you can turn into a home theater, a home gym, a playroom for your kids, or whatever suits you best. The cream colored walls and recessed light makes this room look spacious and bright. The light-toned carpeted floors enhance the openness of the space as well as giving this basement a warm and inviting ambiance. This level also has a bedroom, full bath, as well as French doors for walk-out to the yard. When you want peace and serenity, or you simply want to enjoy some me-time, the stunning scenery of the pastures of this beautiful Charlottesville horse farm for sale can help with that. This property also has a storage shed, front and side pastures, and a small paddock. Properties like this are rare, so don’t miss this chance! All you need to bring are your horses! Call me, Pam Dent, at (434) 960-0161. I specialize in horse farms here in Central Virginia. With my help, you will surely find the best horse farm to fit your budget. Looking for some tips in buying your next horse farm? Check out my buyer’s checklist!